Comments: At the start of the 1980s Marvel UK attempted copying IPC's success with themed titles (e.g. Battle was a war title, Tiger a sport title, 2000AD a SF title, etc) by releasing its own themed titles, Valour and Future Tense, both starting on the same week. While Future Tense concentrated on SF stories, Valour was fantasy themed, at least as far as it could be given it only had access to Marvel's largely superhero output. 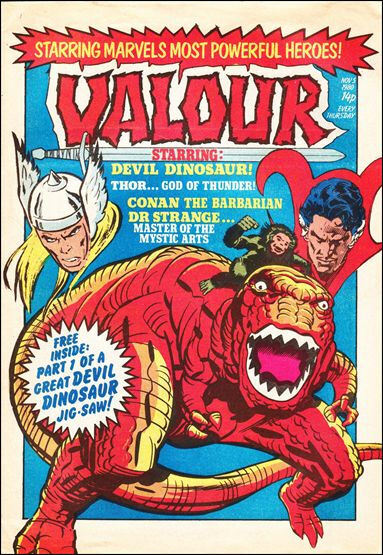 Starting on 5th November 1980 it featured Conan, Doctor Strange, Devil Dinosaur and Tales of Asgard, with Weirdworld being added in issue 13. Poor sales saw it cancelled with its 19th issue, and merged with Future Tense an issue later, with only Weirdworld and Conan surviving the transition. There was also a single Winter Special.